With such precise and scientific looks into their crystal balls it became obvious that none of them knew anything other than it was January and it was likely to snow somewhere in the Northern Hemisphere. I went shopping. The general Rule of Thumb (which has nothing to do with thumbs) says, if it looks like Bad Weather is coming, the best thing to do is to go to the supermarket and stock up on some vittles. I expected the Kroger Market to be wall to wall Hoosiers. It was. I tried to ignore the panicked look in their eyes and focus on my shopping list. I got a cart and headed into the morass. I got a loaf of bread. I got some sandwich meat. There! If things got truly nasty we would not starve. The power could go out and leave us without both the oven and the microwave, but we would still have sliced turkey or ham on white. We would live! I tried to think positively about it all. At most we would be staying in for about two days. If we kept our power we could do quite nicely. I picked up a few cans of Progresso soups, some frozen chimichangas, and some nice looking croissants. It was going to be an International Weekend. When the weather gets ugly I tend to descend into Hermit Mode. I don’t want to see it, hear it, or go out in it. I want to pull the shades, make a pot of tea, and pretend nothing bad is happening outside. I don’t want to acknowledge that there is an outside world and I won’t until the temperature gets into survival range. That’s how I think, but then I keep peeking out of the window. Go figure. We had plans for Sunday. After church we and five other friends had decided to go out for lunch together. Our feeding trough of choice was a monster buffet place across the state line into Illinois called “Richard’s Farm.” I don’t know if Richard is really there or ever was. It is a converted farm into a place where you can overeat until you explode. That was our plan: Drive the 45 miles to Richard’s Farm and conduct classes in gluttony. Then Jim Cantore and the Weather Channel butted in. As the weather outside started to get frightful on Friday, and into Saturday, instant messages began to crackle back and forth. Welllll…On Sunday morning we looked outside and saw some snow, not much, maybe a couple of inches, but we also got a hard freeze and all of the roads, including the 45 miles between us and Richard’s buffet, were ice covered. There was an Advisory issued saying that “If you don’t absolutely have to go out – don’t.” That answered the Big Question. 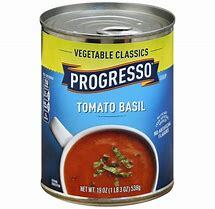 I really enjoyed the Progresso Tomato Basil Soup.